I am sure you all have noticed by now that I love pretty much anything floral!! And this dress from Adabelle's is no exception!! 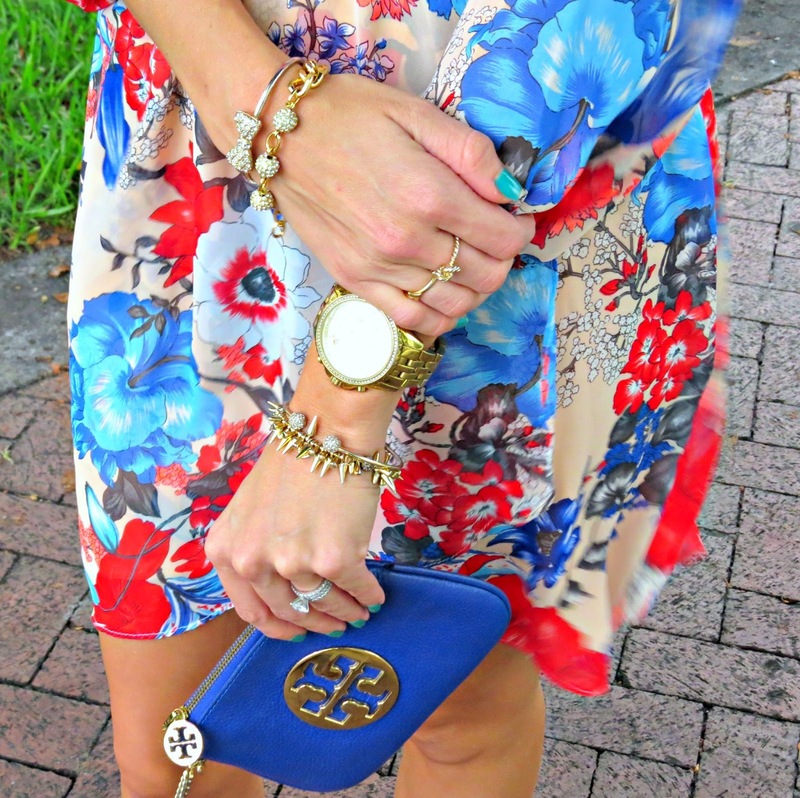 I am a huge fan of a flowy dress and I love the bright colors in this dress! This dress will transition into fall with a pair of tan boots and a jacket! Can't wait for it to cool off!! I am loving these ASOS shoes and I am sorry but for $33 you can't go wrong! I might have to order them in another color! Don't forget to enter the Derng giveaway here! Love the Tory clutch too!! All of these dresses are so cute! I love this look! I really like how the red shoes bring out the red in the dress! I love the shoes with this look too...bold and beautiful! I'm obsessed with all things floral as well! That Tory Burch clutch matches the dress so well... that's like my dream outfit right there. :-) Love your style Jade! Gorgeous dress! I love the colors! You look beautiful! Love this look sooo much, you look stunning! I love the bright colors! The dress is adorable! This is so fab!! I love the dress and those bright shoes with it. This is dress is so pretty Jade, you look great! I love the red shoes. Gorgeous!! I love this dress!! You look so chic! The colors and print on this dress are gorgeous! And those shoes are seriously amazing. I am really loving the gold accessories, as well. So pretty! I would love to feature this look in our "things we love" post tomorrow. I will be sure to link back to your blog! Such a beautiful outfit...especially love the shoes! This is stunning! What a gorgeous pattern and gorgeous red shoes! LOVE the shoes!!!! I'm going to have to order me those! Love them with that dress too! Such a cute look. I love how the red pops in this dress! Most floral dresses seem to veer towards pastel, not brights, so the combo is perfect!